ePuffer recently released the Titan X, which they call a “hybrid.” Essentially this means that you get a fixed-voltage battery along with a tank that features replacable sub ohm heads. We’ll dive into this device in this Titan X review. Disclosure. I received this item for review from ePuffer. This article contains affiliate links. Interesting idea. I will admit that the Titan X keeps the promise of being small. It really is the same size as many of the beginner devices you can find on the market. As for the power of a box mod well… It’s technically true with a max output of 50w. Not all box mods put out power rated in gigawatts, so a 50 watt APV is a real thing. But, in an effort to keep things simple, there’s also no adjustable controls. Instead of controls, the Titan comes with two different heads. A 1ohm head appropriate for simple mouth to lung vaping, and a low resistance .4 ohm head that produces a bit more of a powerful vape. I vaped mostly the .4 ohm head. mainly because I was testing the other one on my Drag and accidentally fired it at 80 watts. It did not end well for anyone. That means I spend most of the time evaluating the Titan X in its performance configuration. In case you’re wondering, no, this device won’t produce the clouds you see using a rebuildable with a ton of power thrown at it. But, for a sort of middle of the road, daily driver vape, it held up better than I expected for an entry-level sort of device. I ended up carrying it as my backup on a recent trip, and as it turns out, used it quite a lot due to a leaky tank on my main hardware. I never got to the point where I felt like I wasn’t having a pleasant enough vaping experience. The compact size also made it very useful when travelling. It’s way easier to carry around a small tube design to grab a quick vape on the run without having to deal with a larger mod. Like many regulated devices, the power does seem to work on a curve. You’ll get full power when the battery is fully charged and the nifty light up logo on the button is white. The button turns blue when the battery starts running down, and once it turns red, it’s pretty much some sad vapor. Charging is simple enough, it’s your basic USB-C cable, just plug it in and charge. The device charges surprisingly fast for having a 1500mAh battery onboard. My one major complaint about this device also happens to be in the charging department. Unlike most devices on the market, you can’t use the Titan X when it is plugged in and charging. Nothing happens. Plan your charging schedule accordingly if you’re going to use this device. In general I found it to be a great travel device, though I’ll never give up big mods and rebuildable tanks for this little guy. 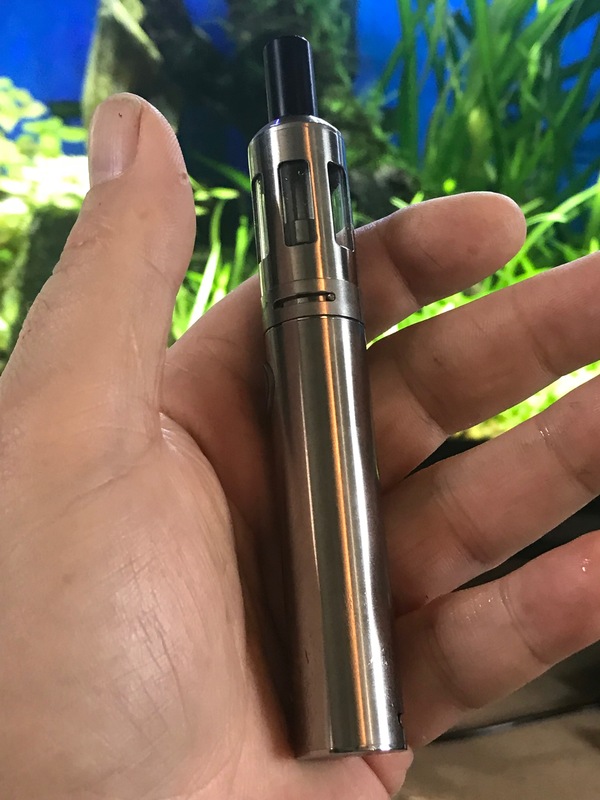 However, if you need a solid second device, or you’re just not a fan of giant box mods, you should click the link below to take a serious look at the ePuffer Titan X.